Rather than traditional British Easter scenes of daffodils and gambolling lambs, this year we can expect to endure the continued icy blasts of this interminable winter. And with cold weather now forecast until late April, many have simply had enough. As the four-day Easter break approaches, the Association of British Travel Agents (Abta) has reported a surge in the number of Britons heading abroad to escape the freezing weather, with some tour operators reporting over 50% increases in year-on-year demand for certain destinations. According to Abta, the Canary and Balearic Islands are the most popular destinations for British holidaymakers this weekend, with daytime temperatures on Good Friday set to reach 26ºC in Tenerife and 18ºC in Mallorca. Egypt (32ºC) and Tunisia (19ºC) have also sold well. You’ve got to feel a bit sorry for the people behind English Tourism Week. Last week’s celebration of English holiday highlights fell rather flat in the face of heavy snowfall across the country. Part of the campaign included a bucket list of ‘101 things to do before you go abroad’ which will be judged over the coming weeks. The family-friendly activities are likely to range from visiting the prehistoric complex at Avebury (recently rated one of the world’s best heritage sites by Which? experts), to climbing Scafell Pike and visiting the Georgian terraces of Bath. But regardless of what the campaign might find to tempt me, I think my holiday time is just too precious to spend huddled under an umbrella, and I’m always tempted by last-minute flights to guaranteed sunshine. Of course there are plenty of wet-weather UK attractions and Visit England has compiled an Easter list of inspiration, called Plan B. You could visit the Eden Project in Cornwall for example – the world’s largest indoor rainforest will at least be warm. Or there’s Nottingham’s City of Caves, part of a network of 400 sandstone caves running under the streets of Nottingham. The caves should at least be dry, even if they’re not too warm. Attractive though these home-grown options are, I don’t think I’m alone in just longing to feel the warmth of sunshine on my skin again. 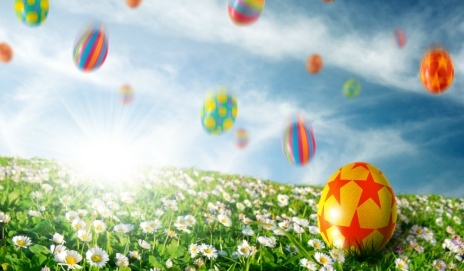 Will you be joining the Easter travel masses at the UK’s airports this weekend? Or have you made British holiday plans that you are going to stick to, come rain or shine? It’s going to be a staycation for me. I want to make the most of living in London, rather than forking out on flights and accommodation for the Easter weekend. The more money I save on travel, the more I can spend on chocolate!